Pawan Kalyan is the biggest name in Andhra Pradesh show business – his several blockbusters over the last many years have proved that. Now, it seems like he’s gathering the same intensity and momentum as he steps into another direction – public service. Pawan Kalyan made his political debut a few years ago when he became the President of the Janasena Party. At the peak of his popularity at the movies, he stepped into the public arena. 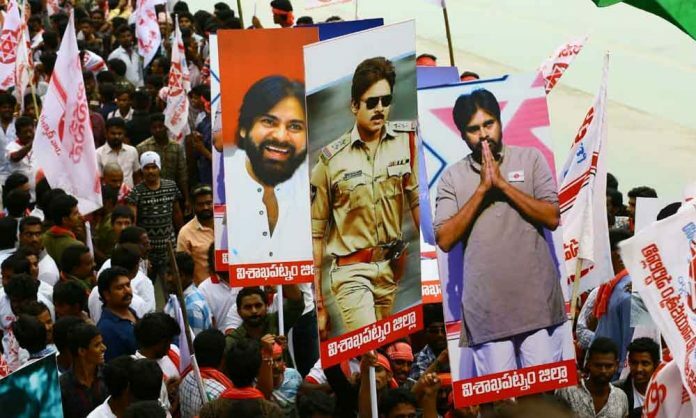 On the 15th of October 2018, Pawan Kalyan held a Parade in Vijaywada to raise political awareness. The response was historic and unprecedented. Over half a million people came out in his support. The visuals were simply spectacular – it was a sea of people that came out for the one man they loved and adored. People from all walks of life joined in this movement. Lakhs of people waited for hours to see their favorite film star who has now taken on the mantle of a young political leader. Film stars and politics have always gone hand-in-hand, especially in South politics. Pawan Kalyan – a new, charismatic leader is on his way. The photographs show what kind of hold he has among the youth and masses.